" " 24 1st Serg't Shurman, Henry G 103 " Sep. 17 1862 Killed in action Antietam. Remv'd from battle-field.
" " 26 " Schrey, Christian F 103 " Sep. 17, 1862 Killed at Antietam. Remv'd from battle-field.
" " 84 Private, Sullivan, John B 61 " "
" " 91 " Salisbury, Wm. C 34 " Sep. 17,1862 Killed in action. Remv'd from Antietam.
" " 94 " Senft, Rudolph 30 Ind't Battery July 27, 1863 Age 57. Remv'd from Antietam battle-field.
" " 102 " Schmidt, Christian A 20 Infantry, Wounded Antietam. Remv'd f'm battle-field.
" " 107 " Smith, J. 34 " Removed from Antietam battle-field.
" B 127 " Seigfried, Charles P. A 33 " Sep. 17, 1862 Killed. Removed from Antietam battle-field.
" " 170 Private, Schaffor, W. 2 " Removed from Antietam field.
" " 179 " Simpson, James H 2 " Removed from Antietam battle-field.
" " 201 " Springer, C. 23 " "
" " 219 " Salmon, S. N. Y. Vols., "
" " 221 " Salisbury, Reubin E. G 1 Artillery, Sep. 17, 1862 "
" C 242 " Sanber, J. B. 69 Infantry, "
" " 271 Corporal, Steiner, Reinhardt I 108 " "
" " 283 Private, Studivent, Charles K 49 " Sep. 30,1862 Died at Bakersville. Remv'd from Antietam.
" " 288 " Shepard, Timothy F 104 " Feb. 13, 1864 Removed from Antietam battle-field.
" " 297 " Sweetman, Henry E 9 " "
" " 299 " Schwerin, Herman G 103 " Oct . 6, 1862 "
" " 308 " Smith, Thomas C 2 " Removed from Smoketown.
" 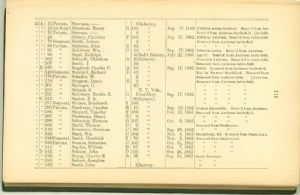 " 318 " Severance, Gersham C 60 " Sep. 23, 1862 "
" " 323 " Slack, Wm. C 104 " Nov. 8, 1862 Sharpsburg, Md. Removed from Smoketown.
" " 336 Corporal, Smith, Hezekiah I 76 " Nov. 2, 1862 Removed from Smoketown.
" " 338 Private, Stearns, Sebastian C 105 " Oct. 31, 1862 "
" " 341 " Snyder, William D 97 " Oct. 7, 1862 "
" D 342 " Schults, John D 105 " Oct. 26, 1862 "
" " 376 " Stamp, Charles E. A 76 " Sep. 14, 1862 South Mountain.
" " 381 " Seibert, Josephus "
" " 383 " Smith, John 4 Battery, "